With regard to security, it’s critical. We keep hearing about products and technologies that are “5G-ready.” But what does that mean? Mobile Service Providers will undoubtedly require 5G equipment that is scalable in terms of capacity and throughput, but does that alone mean the networks will be 5G-ready? In late February at Mobile World Congress 2019, we can certainly expect to see demos of 5G core networks, network slicing, New Radios (5G-NR), and other 5G-ready network components. But what about security? Mobile networks will not be 5G-ready unless the necessary security capabilities are baked into these networks by design. With 5G, everything changes. Critical applications like remote healthcare, remote monitoring and control over our power grids, and self-driving automobiles will all rely on 5G technologies. The networks will become more distributed, and many critical applications will be hosted at the edge of 5G networks and across edge clouds. 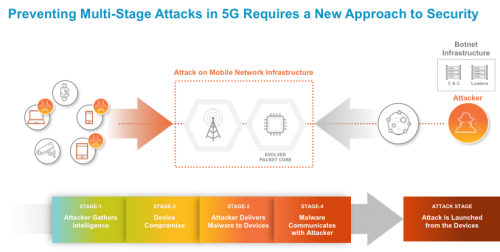 Opportunities for threat actors will emerge if they are allowed to go unchecked, as they will use automation to wage multi-stage attacks and find the least secure portions of the 5G networks to exploit. For mobile networks to be 5G-ready, a new approach for security is required. Even though standards and network architectures are still being defined, mobile operators not only have the opportunity to build the right set of security capabilities into these network evolutions by design, they have no choice but to do it. Today’s cyberattacks are already capable of evading mobile networks, and their continued evolution is indeed a front-and-center concern. Complete visibility, inspection, and controls that are applied across all layers of the network – application, signaling, and data planes. Cloud-based threat analytics – powered by machine learning (ML) – that are leveraged across the different mobile network locations and environments. A cloud-ready platform that ensures consistent security enforcement across all network locations.